When I went to Italy for the first time, I started collecting Laurel Wreaths(Laurus Nobilis). They date back to the ancient Greeks, as well as the Olympics and Pythian games. The aim was to publicly crown the winner with a Wreath of Laurel. People graduating from college would also receive laurel wreaths to recognize their high honors. 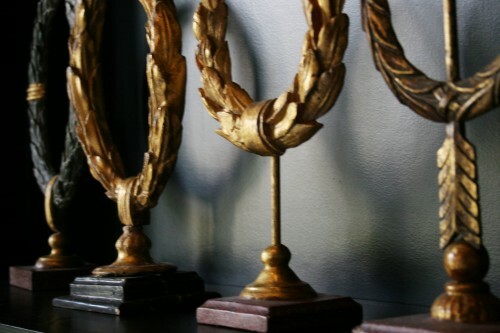 These hand carved wooden laurel wreaths are gilded in gold and are on a marbleized base. They’re difficult to find in antique shops in Italy because they’re handed down like medals within a family from generation to generation. 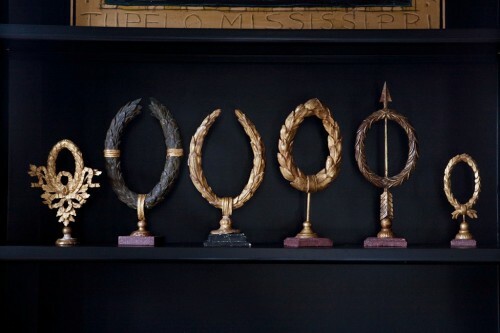 I display them proudly in my library and continue to search for them on my travels to Italy.